The pork belly bánh mì at Cô Ba sells for $8, which made it the most expensive bánh mì I’d ever seen. In truth were I only pursuing sandwiches for my personal pleasure I’d scoff at such a thing and head over to Chinatown, where a sandwich almost certainly just as good can be had for nearly half the price. But I am in this not just for myself but for a community of enthusiasts, so I swallowed my objections and ordered the sandwich. 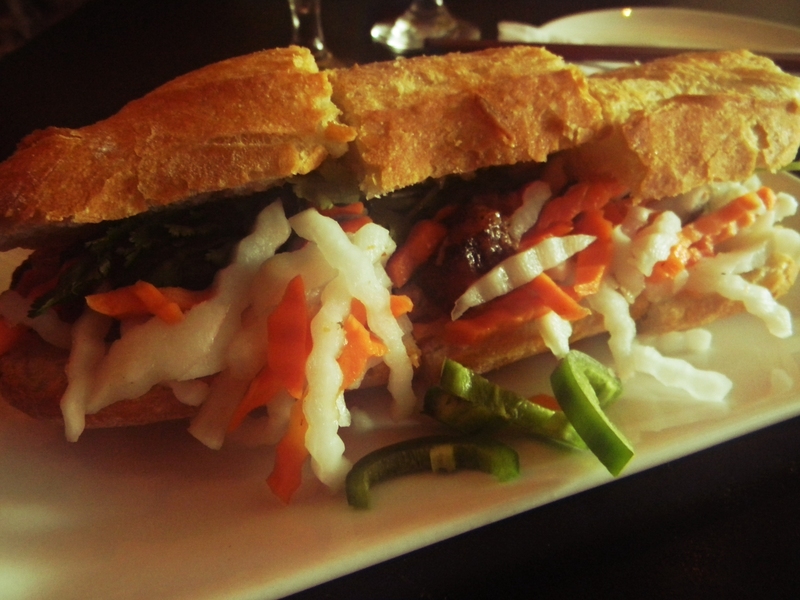 Besides, perhaps it would be the best bánh mì I’d ever had, a sandwich that would change my life. In that case it might very well be worth the $8! Well, cutting to the chase, it wasn’t worth it. Were I not so accustomed to paying between $4 and $5 for a sandwich I might have no objection at all, but I am and so I do. It was a good sandwich, but no $8. I would like to make clear, though, it was a good sandwich. Most everything was in the “pretty good” range, better than acceptable but not so good as to be great. The meat was the real highlight, a rich, fatty bit of pork belly. It’s a shame that the jalapeños you see pictured there are the only ones involved. Jalapeños fit better on this bánh mì than any I’ve ever had, the heat cutting the fat nicely. There was a lot more cilantro than average as well, but the pork belly stood up to that just as well as it did the chilies. In the end, it might not be fair to define a sandwich entirely by its price, but nothing exists in a vacuum. Pork belly isn’t something usually offered on a bánh mì, but all sandwiches exist in a larger context and when a short walk will net you a few bucks saved and a better sandwich, it’s hard to get too excited, pork belly or no. This entry was posted in A Month of Bánh Mì, Sandwich Reviews and tagged Banh Mi, New York, Pork, Pork Belly, Reviews by Pete, Sandwiches I Have Eaten, Sandwiches Made For Me by Pete. Bookmark the permalink. Not taking the price into account is the number one failing of terrible critics. It attempts to signal that one is not too lowly to have a budget constraint, but this usually backfires and demonstrates rather that the critic does not know how people actually make decisions. Food critics seem particularly guilty of this; I am glad to see you avoiding it!